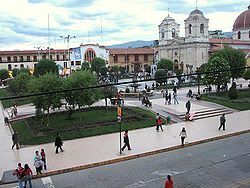 Huancayo is the capital of the Junin Region, in the central highlands of Peru. It is located in Huancayo Province, of which it is also capital. Situated near the Mantaro Valley at an altitude of 3,271 meters, it has a population of approximately 430,659. Huancayo is the cultural and commercial center of the whole central Peruvian Andes area. The area was originally inhabited by the Wankas. At around 500, they were incorporated into the Wari empire. Despite efforts to defend its independence, the Wankas were eventually subdued by the Inca leader Pachacutec in 1460 and the region was incorporated into the Inca empire. It subsequently became a notable stopping point along the Inca Camino Real. After the Spanish colonization (1534), Huancayo was overshadowd by Jauja, 18 km to the north, which the conquistador Francisco Pizarro established as a provisional capital of Peru until Lima took over that role. In 1570, the viceroy Francisco de Toledo established the site as the center of his encomienda Gauncayo. 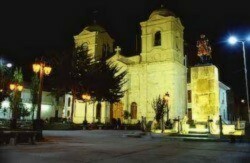 The town was officially established on 1 June 1572 with the title of Santisima Trinidad de Huancayo. During the war for independence, Huancayo was liberated on 20 November 1820. Construction on the cathedral commenced in 1831. Today, in addition to its importance as a center of commerce, Huancayo is known for the crafts and the many festivals of the surrounding towns. Having rapidly expanded in recent decades, it has few remaining colonial buildings; the cityscape is dominated by modern constructions. Peru travel adventure is amazing and interesting because there are many unique places, mountains , beaches and etc. It is served by the Huancayo Airport but travelers usually use the Limean Airport.